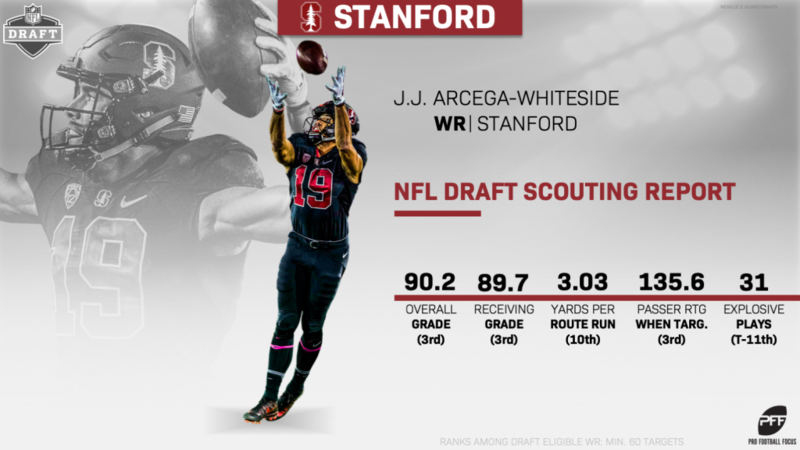 JJ Arcega-Whiteside caught 54.05% of his contested-catch opportunities in his last two seasons with Stanford, ranking 15th among FBS wideouts entering the draft with 25 or more contested targets since 2017. None of the 14 wide receivers ahead of him, however, had more than 59 contested-catch opportunities – Arcega-Whiteside had 74. Arcega-Whiteside’s size, body control, and contested-catch ability paid dividends in the red zone. He caught 23-of-34 targets for 224 yards, three first downs and 18 touchdowns inside the 20-yard line in 2017 and 2018 combined. He also logged just one drop and caught 11-of-16 (68.8%) of his contested-catch opportunities in the red zone, as well. Among the 42 FBS wide receivers in this year’s draft with 20 or more targets in the red zone since 2017, Arcega-Whiteside ranked first in receiving grade (93.9), second in touchdowns (18), and 13th in passer rating when targeted (101.0). Arcega-Whiteside’s work on third and fourth downs falls in line with his red-zone work, as he caught a class-high 62.5% (20-of-32) of his contested targets on such downs in the last two seasons. His two-year receiving grade on third and fourth downs (92.5) also leads all FBS receivers in this year’s draft. With evidence mounting, NFL teams have taken notice. Arcega-Whiteside catches passes through contact, through pass interference, through it all. But his ability to shield defenders away from the ball with his body positioning is truly unique. He, quite literally, boxes out defenders whenever the opportunity presents itself and rarely loses when doing so. His parents, two basketball stars in their respective hay days, played a part in his successful box outs on the football field. Stanford also had players stand in the end zone and hit Arcega-Whiteside with bags, pull on him, hit him, do everything they could to “make it impossible” for him to come down with the ball in practice. But it wasn’t his parents’ basketball experience or the rigorous practice routine that Arcega-Whiteside said was the primary driver behind his contested-catch success – it was effort and willpower. “It comes down to effort, and it comes down to the want to,” Arcega-Whiteside said. “It’s like getting a rebound in a basketball game. The ball’s in the air. You’ve got to have technique. You’ve got to have positioning. But at the end of the day, whoever wants it more is going to get it. And, as mentioned above, Arcega-Whiteside rarely lost as a result.